Protologue: Spices, condiments and med. pl. Ethiopia (Agric. Res. Rep. 906, Belmontia 12): 10 (1981). Korarima, Ethiopian cardamom, false cardamom (En). Korarima, cardamome d'Ethiopie, poivre d'Ethiopie (Fr). Aframomum corrorima is widely distributed in western Ethiopia (Provinces of Kefa, Sidamo, Illubabor and Wollega), Sudan (south-western, Aloma Plateau), Uganda (western) and Tanzania (Usambara Mountains). In Ethiopia it is also occasionally cultivated outside its natural area (around Lake Tana and Gelemso) and it is cultivated in Eritrea. The use of korarima is only known from Ethiopia and Eritrea. The seeds (usually dried, sometimes fresh) are used to flavour all kinds of sauces, for which they are ground and usually mixed with other spices; occasionally they are also used to flavour coffee, tea, bread and butter. In Ethiopia, the seeds are used medicinally as a tonic, carminative and purgative. The arilloid flesh around the seed is edible. Strings of fruits are sometimes used as an ornament, or as rosaries (by the Arabs), and in the past the fruits have been used as money in Ethiopia. Although no statistics are available, the amount of korarima fruits (the seeds are sold per fruit) offered for sale in Ethiopia is considerable. Korarima is present at every market, and is sold for a high price compared to other spices. Some korarima is exported from Ethiopia to markets in Sudan, Egypt, the Arabian peninsula, Iran and India. Export to Europe and the United States is very small, mainly due to the product often being of poor quality. Korarima seed has a mild, sweet flavour and is less peppery or pungent than seed of Aframomum melegueta K.Schum. (grain of paradise). The seeds contain essential oil which has a typical odour and is sometimes called ‘nutmeg-cardamom’. After distillation of dried comminuted fruits, 3–3.5% of a pale yellow volatile oil with a flat cineolic odour can be obtained, in which the following compounds have been found (all monoterpenes, approximate amount of the major ones): 1,8-cineol 32–35%, limonene 7–14%, β-pinene 4–7%, sabinene 7–9%, terpinen-4-ol 3–5%, geraniol 5%, P-cymene 4%, α-pinene, α-terpineol and γ-terpinene 3% each. Sesquiterpenes were identified in another analysis; the total was dominated by about 75% monoterpenes including 1,8-cineol (38%) and terpinyl acetate (11%), and 17% sesquiterpenes including nerolidol (11–14%), β-caryophyllene (2%) and caryophyllene oxide (1%). Perennial, rhizomatous, aromatic herb; leafy stems 1–2 m tall; rhizome subterete, up to 1 cm in diameter, profusely branched, red-brown, covered with thin, subovate scales up to 6 cm × 4 cm and bearing thin, fibrous, pale brown roots; stem unbranched, mainly formed by the leaf sheaths, subterete, up to 1 cm in diameter but at base usually thickened up to 3 cm diameter. Leaves alternate, distichous, simple; sheaths covering each other, yellow-green, with prominent veins and scarious, ciliate margins; ligule deeply bilobed, thin, ciliate, lobes acute, up to 3 cm long; petiole 4–10 mm long, deeply grooved above; blade elliptical to oblong, 10–30 cm × 2.5–6 cm, obliquely obtuse at base, cuspidate at apex, margin entire, glossy dark green above, paler green and often a bit reddish below, lateral veins fine, pinnately arranged but parallel, making a very sharp angle with the midrib, 4–9 per 5 mm above, 12–16 per 5 mm below. Inflorescence a shortly stalked head arising from the rhizome near the base of a leafy stem, sometimes situated at the end of a rhizomatous runner, up to 5-flowered; peduncle up to 7 cm long, covered by imbricate, purplish-brown, subovate scales 2.5 cm × 1.5 cm; head covered with imbricate, purplish-brown, ovate to square bracts up to 4.5 cm in diameter; each flower surrounded by a scarious, suboblong bract up to 6 cm × 2 cm, bidentate, ciliate. Flowers bisexual, zygomorphic; calyx spathaceous, up to 4.5 cm × 1 cm; corolla tubular, 3-lobed at apex, white to pale violet, tube up to 4.5 cm long, densely woolly in upper 2 cm, lateral lobes ovate-oblong, up to 4 cm × 2 cm, dorsal lobe up to 4 cm × 3 cm, labellum obovate in outline, with a half-tubular fleshy claw up to 3 cm × 1.5 cm and a subovate to orbicular lobe up to 3 cm × 3.5 cm, thin, slightly notched, yellow at throat inside; fertile stamen 1, filament fleshy, slightly rounded, 6 mm × 5 mm, connectivum fleshy, at apex with 2 lateral horns 4 mm long, thecae 2, narrowly ellipsoid, about 11 mm × 1 mm; ovary inferior, 3-locular, style thin, terete, up to 5 cm long, stigma funnel-shaped, 2 mm wide, ciliate, top of ovary provided with 2 (sometimes more) lobed, fleshy outgrowths (probably nectaries), partly clasping the style. Fruit an indehiscent, subconical berry up to 6 cm × 3.5 cm, usually showing 3 longitudinal furrows but sometimes more, shiny green when immature, turning bright red at maturity, with 3 cells containing 45–65 seeds each. Seeds subglobose in outline but usually somewhat angular, 2–5 mm in diameter, testa finely lined, glossy brown, hilum circular, whitish, aril thin, a bit fleshy, completely covering the seed. The genus Aframomum comprises about 50 species and is widely distributed in the wetter parts of tropical Africa. It is closely related to Amomum from tropical Asia and was formerly included in it. The differences between the 2 genera are not constant and it is possible that in the future the 2 genera will be united again. Aframomum zambesiacum (Baker) K.Schum. occurs in similar habitats as Aframomum corrorima. The seeds of the former species, however, are not used, and in Ethiopia it is called ‘monkey's korarima’. 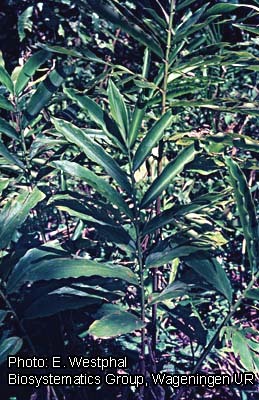 Two major differences with the real korarima are that its leaves are less aromatic upon crushing, and its inflorescences bear 25–50 flowers (korarima only up to 5). In Ethiopia, korarima flowers between January and September. Fruits mature about 2–3 months after flowering. In Kefa Province of Ethiopia the main flowering period is June–July, with fruiting in September–October. Most probably the flowers are open for only one day. The position of the stigma in the flower, below or against the base of the thecae of the anthers, hints at self-pollination, but there is neither observational nor experimental evidence. The presence of large nectaries at the top of the ovary make insect visits probable. In many other Aframomum species, the stigma is situated at the top of the anther thecae and cross-pollination caused by insects is the rule, although the plants are self-fertile too. Animals such as monkeys eat the aril around the seeds and certainly contribute to natural dispersal of the seeds. Korarima grows naturally at (1350–)1700–2000 m altitude in slightly shaded, more or less open sites in higher altitude rain forest. Annual rainfall varies from 1300 mm to more than 2000 mm; there is no distinct dry season but usually most rain falls in June–August (50–60%). The annual average temperature is about 20°C. In Ethiopia, korarima grows in almost the same habitats as wild coffee species (Coffea). Korarima can be propagated by seed but planting rhizome parts is probably easier and quicker. No information is available about cultivation methods of korarima. Possibly the method of cultivation is similar to that for the West African Aframomum melegueta K.Schum. (grain of paradise, melegueta pepper). The seeds of the latter species are sown in the rainy season in the shade of other crops and transplanted the next rainy season to more even spacing. Plants start producing fruits 3 years after sowing and may continue to fruit during the next 4 years. Perhaps people influence the wild population of korarima by some kind of protection and aid wider dispersal by planting. No serious diseases or pests are known for korarima. The rust Puccinia aframomi has been observed on korarima leaves in Ethiopia. Fruits are mostly harvested from the wild. The seeds are best harvested when the fruits are red and mature. The yield can be as much as 500 kg of dried fruits per ha (without fertilizers). The fruits should be carefully dried. In Ethiopia, they are usually pierced near the top, strung on a rope and hung to dry in the sun. If the fruits are not properly dried, or are mixed with immature ones, the end product is of poor quality. Germplasm collections or breeding programmes for korarima are not known. Germplasm collection and conservation, in situ and ex situ, is recommended because of the rapid degradation and destruction of mountain forests. Aframomum corrorima will probably remain of some importance as its aromatic seeds will continue to be attractive. However, large-scale cultivation for its seeds is not expected. Although not yet in direct danger of extinction, korarima, like all Aframomum species, deserves to be part of germplasm collections. Baser, K.H.C. & Kürkçüoglu, M., 2001. The essential oils of Aframomum corrorima (Braun) Jansen and A. angustifolium K.Schum. from Africa. Journal of Essential Oil Research 13: 208–209. Lock, J.M., 1976. Notes of some East African species of Aframomum (Zingiberaceae). Kew Bulletin 31: 263–271. Molla, B.A., Asfaw, N. & Lwande, W., 1994. Chemical constituents of the essential oil of Aframomum corrorima from Ethiopia. Sinet, an Ethiopian Journal of Science 17: 145–148. Poulsen, A.D. & Lock, J.M., 1997. New species and new records of Zingiberaceae and Costaceae from tropical East Africa. Kew Bulletin 52: 601–616. Biftu, T., 1981. Essential oil composition of Aframomum korarima (seeds). Journal of Chromatography 211: 280–283. Demissew Sebsebe, 1993. A description of some essential oil bearing plants in Ethiopia and their indigenous uses. Journal of Essential Oil Research 5: 465–479. Jansen, P.C.M., 2002. Aframomum corrorima (Braun) P.C.M.Jansen. In: Oyen, L.P.A. & Lemmens, R.H.M.J. (Editors). PROTA (Plant Resources of Tropical Africa / Ressources végétales de l’Afrique tropicale), Wageningen, Netherlands. Accessed 13 April 2019.